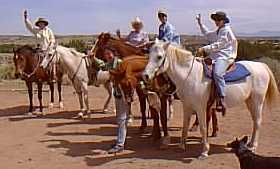 The Makarios ranch is located 3 miles east of Cerrillos off Highway 14, also known as the Turquoise Trail. We are located on Camino Querencia, just south of the turnoff into the actual village of Cerrillos, hwy. 14 heading toward the town of Madrid. From Santa Fe: From Exit 278A at I-25 take Highway 14 south sixteen miles. Cross the bridge over the Galisteo Creek, go south just pass the turnoff into the village of Cerrillos. The 1st road to the left is Camino Querencia. Allow 30 to 40 minutes travel time from downtown Santa Fe. From North of Santa Fe: Go south on US-285 S/US-84. Merge onto NM-599 S/VETERANS' MEMORIAL HWY via EXIT 166 toward SANTA FE RELIEF ROUTE, 14 miles. Turn RIGHT onto NM-14 S, 13.3 miles, go south just pass the turnoff into the village of Cerrillos. Cross the bridge over the Galisteo Creek. The 1st road to the left is Camino Querencia. From Albuquerque (Scenic Route): From the intersection of I-25 and I-40 take I-40 east out of Albuquerque. Take exit 175 (Tijeras/Cedar Crest) to Route 14 north (aka the Turquoise Trail). Follow Route 14 north through the towns of Cedar Crest, Golden and Madrid. The Cerrillos turn-off is 37 miles north from I-40. About 2.5 to 3 miles past Madrid look for Camino Querencia on the east (right) side of the road. From Albuquerque (via I-25): Take I-25 north out of Albuquerque. Take exit 271 (La Cienega). Turn right from the exit and take Frontage Road south to County Road 45. Turn left onto County Road 45 and take it to Highway 14. Turn right (south) onto Highway 14 and take Highway 14 for approximately 6 miles. From Exit 278A at I-25 take Highway 14 south sixteen miles. Cross the bridge over the Galisteo Creek. The 1st road to the left is Camino Querencia. Allow 60 minutes travel time from downtown Albuquerque. SCENIC SHORTCUT From Albuquerque...... Take the WALDO CANYON exit (about 2 miles after the Cochiti Pueblo Exit), turn right and drive east 8 miles down waldo canyon road....... it is dirt, so if it has been raining a lot, be extra cautious. when you read the village of cerrillos, waldo canyon road dead ends at a paved road; turn right, go over RR tracks, and take a left at the stop sign; mary's bar is at that corner. road ends at Hwy. 14, where you turn right. turn left at Camino Querencia, first road south of the Galisteo River Bridge.